Let me get one thing straight before I even start this list. The King Jame Bible on your shelf right now is not the same as the original 1611 KJV. In fact, the 1611 KJV Bible that you can buy on amazon or any other Bible store is still not the same as the real 1611 King James. The Bible you see above…..is “like” the 1611 version. Except it’s missing all the Apocryphal books. Which, contrary to popular belief, were included in all the original Bibles. 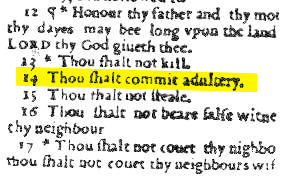 But just to stay as “pure” as possible, I will only quote from the 1611 KJV Bible in this post. And when hee had apprehended him, hee put him in prison, and deliuered him to foure quaternions of souldiers to keepe him, intending after Easter to bring him forth to the people. This is one of the funnest things to point out to people who refuse to read those wretched, evil, new-age translations, and swear by only the good old King Jimmy. Why is it so fun? Because most of them are willing to bet an arm and a leg that the translators of the KJV would NEVER make a mistake like that! This is much to big of a mistake to overlook. And after all, the King James is the perfect word of God in English. At least that is what they were taught to believe.